We are Tech27 Systems Ltd. Our address is Blairs College, South Deeside Road, Aberdeen AB12 5LF. Scotland, United Kingdom. 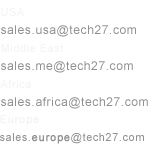 You can contact us by post at the above address, by email at info@tech27.com or by telephone on +44 (0)7900430255. We are not required to have a data protection officer, so any enquiries about our use of your personal data should be addressed to the contact details above. If you decide that you do not want cookies to be set on your device , you can adjust the settings on your internet browser and choose from the available Cookies setting to best meet your preferences. While setting options may vary from browser to browser, you can generally choose to reject some or all cookies, or instead to receive a notification when a cookie is being placed on your device. For more information, please refer to the user help information for your browser of choice. Please keep in mind that cookies may be required for certain functionalities, and by blocking these cookies, you may limit your access to certain parts or features of our sites and platforms. When you submit an enquiry via our website, we ask you for your name, your email address, your mobile number, service of interest, product of interest and a brief description of your enquiry. Your information is stored in our mail server provided by Yahoo. We have a contractual agreement with Yahoo that commits them to providing an appropriate level of safeguards for your personal data. We will read your message and normally respond to you either via telephone or via email. We may ask for your consent to retain your information in our system in order to send you further information that we think may be of interest to you. We keep enquiry emails for two years, after which they are securely archived and kept for seven years, when we delete them. These mails are kept for three years after the last contact with you. We have provided no online purchase facility from our website. We do not send you any newsletters and there for you need not sign up. We do not provide facility to download any sample document from our website. We do not provide facility to review about us in our website. We do not conduct any feedback survey in our website.